Last Sunday, we saw Christ manifested to the Gentile world through the Maji from the East. This Sunday, we see Christ manifested to the Jewish world through John the Baptist, who boldly proclaimed, "Behold the Lamb of God". In our first reading (Isaiah 49:3,5-6), Isaiah prophesied about the calling of God's servant Israel to be a "Light to the Nations". It is a calling we share with Israel and with John the Baptist, to be that light that points, leads others to Christ. The LORD said to me: You are my servant, Israel, through whom I show my glory. 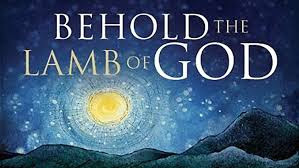 Now the LORD has spoken who formed me as his servant from the womb, that Jacob may be brought back to him and Israel gathered to him; and I am made glorious in the sight of the LORD, and my God is now my strength! It is too little, the LORD says, for you to be my servant, to raise up the tribes of Jacob, and restore the survivors of Israel; I will make you a light to the nations, that my salvation may reach to the ends of the earth. In our Gospel reading (John 1:29-34), we hear of John the Baptist living out the same calling as ancient Israel, leading others to Christ - 'Behold, the Lamb of God". John the Baptist saw Jesus coming toward him and said, "Behold, the Lamb of God, who takes away the sin of the world. He is the one of whom I said, 'A man is coming after me who ranks ahead of me because he existed before me.' I did not know him, but the reason why I came baptizing with water was that he might be made known to Israel." John testified further, saying, "I saw the Spirit come down like a dove from heaven and remain upon him. I did not know him, but the one who sent me to baptize with water told me, 'On whomever you see the Spirit come down and remain, he is the one who will baptize with the Holy Spirit.' Now I have seen and testified that he is the Son of God." In our Epistle reading (Corinthians 1:1-3), we hear the opening greeting of St. Paul's letter to the Church in Corinth. This short greeting included the clarity that his beloved are "sanctified in Christ Jesus, called to be holy, with those everywhere." Paul, called to be an apostle of Christ Jesus by the will of God, and Sosthenes our brother, to the church of God that is in Corinth, to you who have been sanctified in Christ Jesus, called to be holy, with all those everywhere who call upon the name of our Lord Jesus Christ, their Lord and ours. Grace to you and peace from God our Father and the Lord Jesus Christ. We learn in our readings today that throughout salvation history, God has called upon and relied upon his children to be beacons of hope and light, leading others to God. That is no less true today as we are the servants called by God to point others, lead others to Christ. May it be we through whom God "shows his glory".